In recognition of how well it was able to preserve its treasured aesthetic while upgrading for safety and accessibility, UCLA’s William Andrews Clark Memorial Library will be honored by the California Preservation Foundation with the 2018 Preservation Design Award for Rehabilitation. The California Preservation Awards showcase the best in historic preservation, recognizing significant achievements in architecture, history, design and engineering. 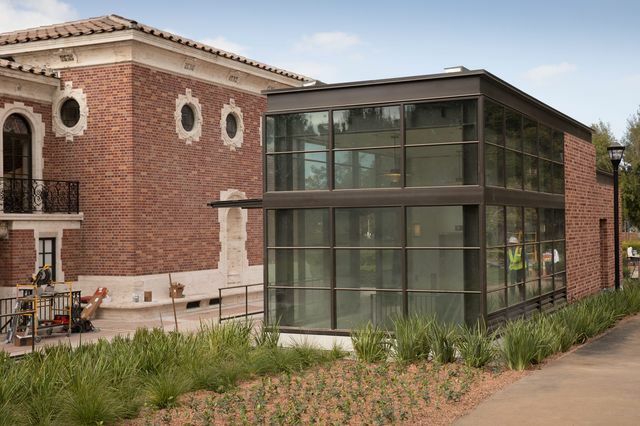 The honor was bestowed for the library’s recent seismic retrofit and entry pavilion project, which included an elevator and ramps that improve access for people with disabilities. The California Preservation Foundation exists to ensure that the rich diversity of California’s historic resources are identified, protected and celebrated for their history and for their valuable role in California’s economy, environment and quality of life. The award will be presented on Friday, Oct. 19, at a gala dinner and awards ceremony at Millennium Biltmore Hotel in Los Angeles. “The Clark Library seismic retrofit and pavilion project is an important contribution to the preservation of our state’s rich and diverse historic resources,” the organization said in a statement announcing the 2018 award winners.